It’s no longer December or 2017 but I decided to still go ahead and review this monthly tea club box. Technically speaking the teas themselves are not Christmas flavours so I don’t think it will be too out of season. I hope everyone enjoyed their holidays and new years. Bruu Tea like to put in a small surprise each month, this time it was a few Christmas paper decorations (the holly and snowflakes) along with a chocolate sweet and a funny card. A Caribbean inspired black tea blended with chocolate and coconut. Personally I don’t think you can go very wrong with chocolate and coconut, bounty was always one of my favourite chocolate bars growing up. The blend looks nice, lots of assorted chunks and pieces, plus it bares a dark chocolate scent with a touch of coconut. Like a dark Bounty bar but with added wood from the tea base. Steeping Parameters: 1 tsp in boiling water for 3-4 minutes. A drop of milk has been added. Once steeped the resulting tea carries the same chocolate and coconut scent as it’s raw state. The blend is sweet and creamy with chocolate, nut, wood and coconut tones. The base is not too rich nor the chocolate sour, which aids the blend. Instead the chocolate is a right level against the wooden base and the naturally sweet coconut lightens it into a pleasant cup of tea. I imagine the drop of milk also helps keep this non bitter and creamy, plus it helps with the dry nut like after taste. A nice blend, not too strong or sweet and flavours taste natural. I feel it’s probably better with milk and sugar which I don’t mind as it’s to taste. Like a chocolate tea, it’s not chocolatey enough to be hot chocolate but the combination of two means you get both chocolate and tea for the price of one. What’s not to like? 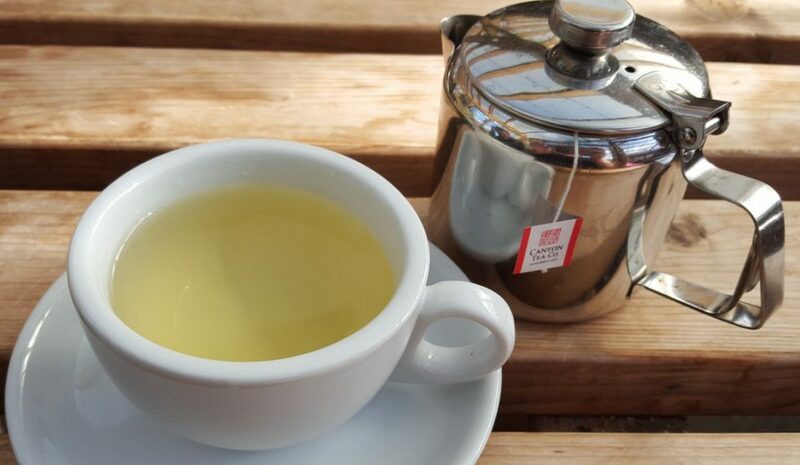 A smooth sweet organic almond green tea with refreshing tickles of orange & safflower. This tea has piqued my interest the most of all three blends I received. I love the fact it’s organic, I love green tea, I love orange, i love almond and I love pink peppercorns. Basically most of the ingredients that make this blend, everything about it is what I look for in a blend. While chocolate tea is nice I’m a savoury person and find myself wanting orange and pine teas for comfort. The blend looks nice; some very small green tea parts of leaves that have broken and almost become a dust, aside from that it’s as you expect. I can see the peppercorns and lots of chopped safflower, also at quick glance the almonds too. No orange that I notice though. In smell this is divine. Sweet almond with a touch of refreshing orange in the background. I gave this to my husband to sniff without saying which tea it was and he picked out the almond. I had to wrestle it back off him because it smells that nice. He said it’s like almond cake. The orange behind adds a refreshing tone, similar to that of mint, it lifts the almond and adds depth. I could sniff it all day! Steeping Parameters: 1tsp in 80C water for 2-3 minutes. Once steeped a golden liquid is produced that bares a sweet almond, somewhat marzipan like scent. The first few sips reveal orange and almond with a sweet yet slightly sour after taste with some dryness. Reminds me a little of pine flavoured tea, it bares the same refreshing quality. The orange is also slightly wax like, but there is a creamy quality to help it stay smooth and sweet. It’s so easy to drink, I devoured my cup of this in very short time. It leaves a beautiful after taste that lingers for a while. Pistachios pieces, apple pieces, orange peel, wild strawberry leaves, white cornflower blossoms, raspberry leaves, sweet blackberry leaves, pink peppercorns & hazelnuts. This sounds inventive! A digestive biscuit flavoured tisane. Perhaps a good invention for those prone to the odd biscuit or two, especially since with a new year usually comes a new weight loss plan for many people (myself included). It’s a large leaf blend on the whole with a lot of bits and pieces. I can’t identify it all but can note some nuts and various leaves at a quick glance. Smell wise it’s interesting….my husband said it smells like Weetabix and he has a point. I can smell some sort of cake or baked product, not unlike biscuit but perhaps too strong for one. Steeping Parameters: 1.5 tsp in boiling water for 8-10 minutes. Once steeped it bares a baked bread and herbal scent, I can note some resemblance to biscuits but still not perfect. Flavour is herbal, SO very herbal. Like licorice…actually it does taste like it. It’s refreshing and dry, slightly sweet with dark baked attributes and a dry after taste. Like dipping a mild biscuit into licorice tea. It’s not biscuity enough in comparison to the herbiness. Honestly this blend is not for me and I can’t drink it. I HATE licorice and that is all I can taste. I feel the mix of hazelnuts and herbs has made a complex licorice type flavour and it’s making me pull faces. It’s good if you’re a licorice fan or really into hazelnuts, but alas I am not. To be fair I am not rating this tea as it’s not their fault I dislike it. It was a nice selection of teas but you can’t like them all. I know the first two will be finished quickly enough but I will probably gift the pack of Cheeky Digestive. If any of my readers wants to try it let me know and I will pass it along, though know it’s first come, first serve as I don’t do favouritism. Send me an e-mail on kittylovestea@gmail.com to claim it. I look forward to seeing what Bruu Tea have in store for me in the first box of 2017.